I had the opportunity last night to go to a one-night only, screening of the Aussie, Action/Horror film “Wrymwood”, co-directed by Kiah and Tristan Roache-Turner. I’ve been following the film for several months via social media, so it was great to finally get the chance to see it. Wyrmwood is set on the eve of a post-apocalyptic zombie outbreak, that follows the journey of three different characters. Barry (Jay Gallagher), a skillful mechanic and family man, whose life is shattered when he has to do the unthinkable to his wife and child. Barry’s sister, Brooke (played by Bianca Bradey), who lives in a different town and finds herself trapped in her garage when the outbreak starts. Then, rounding out the group is Benny (Leon Burchill), a young aboriginal man whose brother turned while they were on a hunting trip. Barry and Benny team up in the hopes of finding Brooke, who unbeknownst to them, has been taken by a team of soldiers in gas masks and delivered to a mad scientist (played by Berynn Schwerdt). The film also stars Luke McKenzie, Keith Agius and Catherine Terracini. 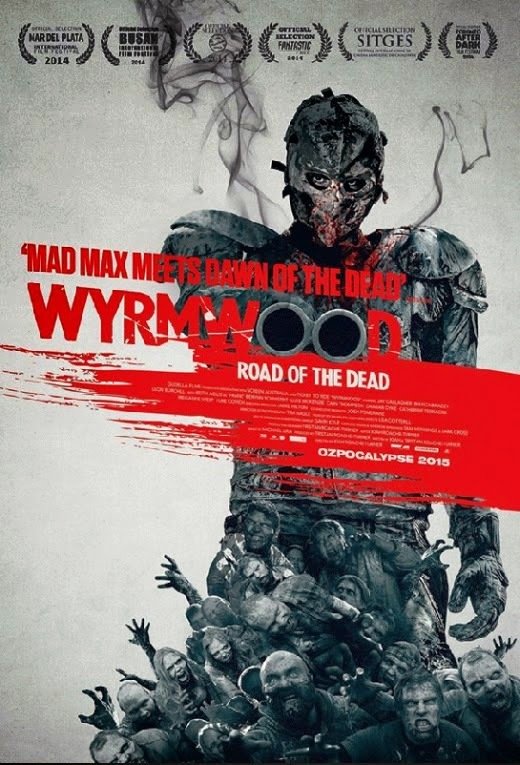 Wyrmwood is the first full length feature from this duo, I don’t know the budget here, but I’d estimate it to be between $500,000- 1 Million dollars. I promised the guys I would do a write-up for the film upon its official release, so here we go. The film has been marketed as “Dawn of the Dead” meets “Mad Max”. That’s some sort of company to be in, but it also raises people’s expectation. I think the style in which this is shot works. Most of it has a Steadicam look, and that helps maintain an intensity that goes hand in hand with this genre. There were a few nice uses of crane shots as well, just to help break things up somewhat. The color grading also works in the films favor, it has a similar aesthetic appeal to that of John Hillcoat’s “The Road”. Everything has the washed out look, the use of a lot of grey and dull greens for the terrain. For a country and landscape that’s already dry, Wrymwood does a good job of making it feel like the end of the world. Majority of the film takes place on roads you would take when traveling from city to city. It’s unrealistic at the same time though, because including zombies in that environment, when they would most likely be found in the city doesn’t ring true. The audio levels are pretty good and the fast editing style/overall pace of the film suits it. This is an entirely new bunch of faces to me, so I didn’t really know what to expect. I’m even harsher on Australian films than I am on just about everything else. Simply for the fact that we don’t make the best films, that’s not to say we don’t have a lot of talent, it’s just the films themselves often accomplish nothing. I really liked the fact that the Turner’s included Aboriginal actor Leon Burchill, in one of the lead roles. Sure there were moments of typical humor surrounding the Benny character, with the beer jokes and some other cliches, but for the most part he was a really fun and entertaining character. I’ve never seen an aboriginal in a lead role before, so I really respect that decision. Gallagher does a pretty good job too, considering he is in ninety percent of the movie it’s a lot of material to learn. Some of his more emotional scenes fell a bit flat, and or forced, but that’s in part because of the writing. I felt the lack of character development, in regards to the family bond he was supposed to have played a part in that. We all know one of the most important aspects of a zombie film, lies in the effects department. Considering this isn’t Dawn Of The Dead, or any other number of huge Hollywood films, Kiah and Tristan boldly deliver on most fronts. Everyone knows I like my blood and gore levels through the roof (haha), I don’t want to spoil any of the kills in this, but we see the use of chains, needles, handguns, rifles, drop saws and even a huge harpoon gun (haha), the only thing missing was the classic chainsaw. Most of the effects work is practical and looks great too. The odd use of CG blood sprays was okay, but they do look a little different to the real stuff. 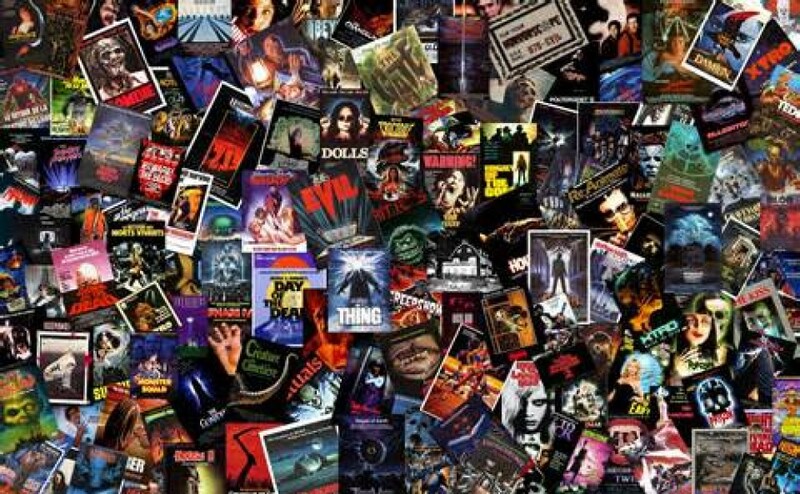 The opening of the film is hurried and some of the editing frenzy, especially with a lot of the fast cuts during the early action sequences. On several occasions you get 20 or 30 different shots in such a short space of time, it can get hard on the eyes. It’s clear very early on, that the film is going to cover at least two or three different characters and their journeys, but I think the story might have benefited from some narration. After all, It helps the audience get into the mind-set of your main character. I liked the plot point of having Barry trying to reach his sister in Bulla Bulla, but Brooke’s (sister) character arc, could have been very different and worked just as well. I understand with the zombie premise you can be as ridiculous as you want and get away with it. However, the mad scientist, and the mind control, seem like aspects from another genre and don’t really fit that well in the context of this story. Why couldn’t she have just been trying to survive, while trapped somewhere??. Instead the brothers have taken the familiar trope of military experiments, and dished it up in the same fashion we’ve seen so many times before. The story feels like its going to be all over the place in the beginning, but worry not it finds its place after the first twenty minutes. Some of the overly Aussie jokes fall rather flat, coupled with an exaggerated amount of profanity that often feels forced. As I mentioned previously, the acting is pretty decent but some of the emotionally heavy, dramatic themes either don’t work because of our Australian ways, Or it’s the writing, I haven’t figured out which one yet. The zombies in this film look very good, given the modest budget. I doubt the crew would have had the time to do such extensive makeup on every one of the actors playing zombies. So It’s hidden pretty well, only in the odd frame can you see certain zombies haven’t had as much detail done. The continuity, concerning the amount of blood Barry is covered in throughout the film isn’t perfect either. Sometimes it’s not as fresh as it should be, other times the amount on his body varies from shot to shot. The scene with his daughter turning, where he continues driving in the car without being attacked by her, didn’t seem realistic enough. Neither did certain zombies being killed by a nail gun, as a rule something so simple doesn’t usually keep them down. There’s plenty of action here though and most of it is choreographed well, but the final fight of the movie was rather lack-luster. It reminded me of that final fight in “Elysium”, but not as good, and full of forced Aussie banter. The film also foreshadows the use of the boomerang (haha), to be fair it does get used, but not in the way I was hoping. The action could have been even more brutal, and I expected a decapitation at some point, especially when it’s a zombie flick. I’m probably being extra critical here, when regarding the experience levels of those involved and their available budget, Wyrmwood does it pretty well. 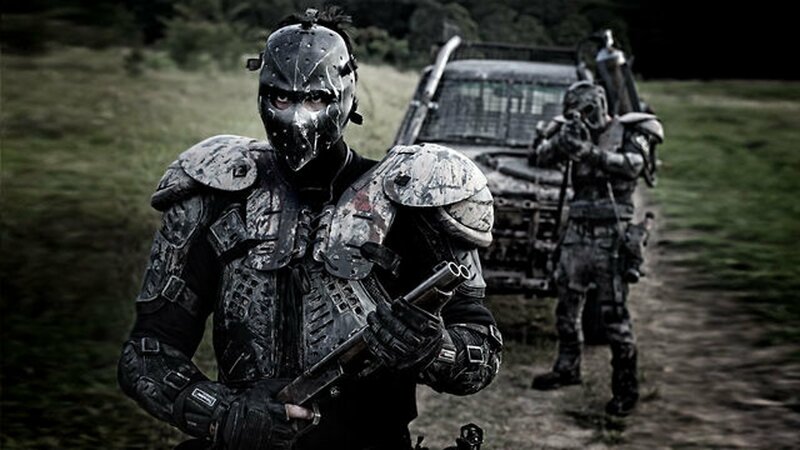 Wyrmwood is quite a treat, it doesn’t reinvent the genre, and it does cash in on the success of its predecessors but there’s also a lot of stuff to like here. The brothers show a solid grasp of the technical aspects of film-making, along with the eye for most details. 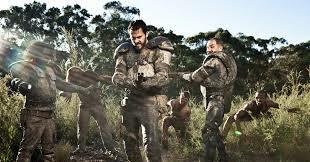 The fusion of carnage and dry humor works in a very similar fashion to another Aussie gem called “100 Bloody Acres”. Topping it all of, the effects are admirable I was just hoping to see even more of them. There are a few issues in the writing that needed fixing. Changes could have included, a less thin reasoning for the outbreak, along with a more powerful ending. One maybe involving a boomerang chopping someone’s head off?? (haha), just a thought people. Other than those minor hiccups, this is some of the best independent work Australia has seen in a long time. Well done boys! Keep an eye out for the official release in April.